While the word “yacht” isn’t exactly synonymous with the image of “old-school, rough, tough, good-ol’-boy” NASCAR drivers that’s often painted, even the most famous of those, the late Dale Earnhardt Sr., had a few. One of those yachts, a custom-built boat called “Sunday Money,” is up for sale. But it’ll take a bit more than just Sunday money to buy this one. At $4.2 million, it’ll probably take all of the Monday, Tuesday, Wednesday, Thursday, Friday, Saturday and Sunday money you can collect, and then some. The listing is also $200,000 higher than what the 9,802-square-foot North Carolina mansion that acted as Ricky Bobby’s home in Talladega Nights sold for last year. Perhaps you could petition the sweet Lord Baby Jesus for more days in the week. Sunday Money is one of several yachts Earnhardt had, according to a backstory on the listing from the Charlotte Observer, which mentioned two others that he used for fishing—a 1989 yacht Earnhardt bought used that’s currently listed for $390,000, and one that goes by Earnhardt’s “Intimidator” nickname and is still owned by Earnhardt’s widow, Teresa Earnhardt. But Earnhardt never really got to enjoy the multi-million-dollar Sunday Money, according to the Observer, since his fatal 2001 Daytona 500 wreck came before it was completed. 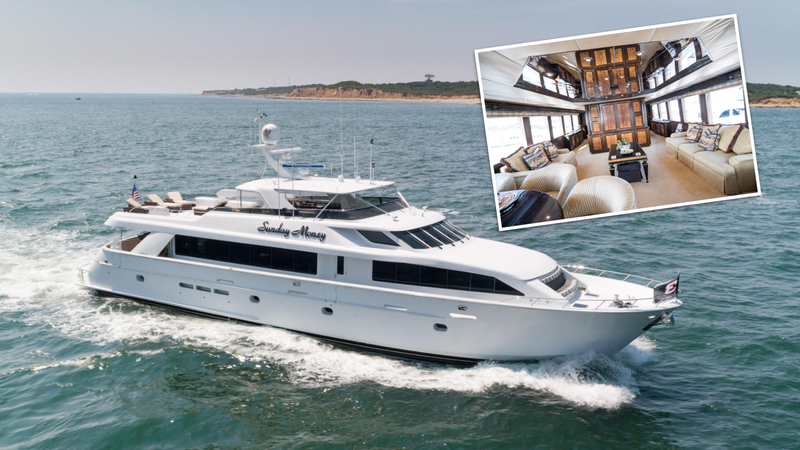 The yacht was “close to completion” when Earnhardt died, a former Hatteras Yachts captain told the Observer, and it’s full of Earnhardt’s custom touches despite going through two subsequent owners. There’s also a giant, black No. 3 flag mounted on the front and an American flag on the back, in case there was any doubt about whose yacht this originally was. Given the choice between this $4.2-million water mansion or the $4-million, 10,000-square-foot actual mansion from Talladega Nights and their moderate ties to NASCAR, it seems only obvious which is the better deal—the one with more space and no potential to meet one of many disastrous fates at sea. But, of course, if you have this kind of cash, there’s probably no need to choose just one anyway.